Apple CEO Tim Cook is among a group of high-profile investors in Nebia, a San Francisco-based startup that has created a water-efficient shower head, according to The New York Times. Nebia is a self-installed shower system that atomizes water into millions of droplets to create 10 times more surface area than a regular shower for up to 70% less water consumption than a traditional shower head. Nebia Shower was recently introduced on crowdfunding website Kickstarter and has quickly reached its $100,000 funding goal, with over $130,000 in pledges and counting to be paid out to the six-person company on September 11. The shower head is available for a pledge between $269 and $299 and will retail for $399 once released. 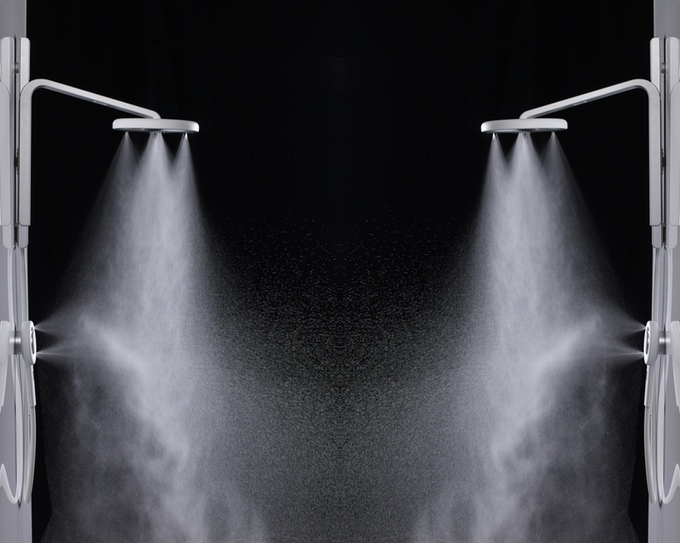 According to the Kickstarter page, Nebia has tested its shower head with students, employees and customers at Equinox Gyms, Google, Apple and Stanford University. Apple noted that Cook's funding towards the Nebia was a personal investment, but declined to comment further on the matter. Other investors include Michael Birch, Y Combinator and the Schmidt Family Foundation. Welcome to Apple Shower, a 16L (liters per day) version starts at just $999.99, for just $500 more, you can get the 64L version and for just $1999.99, you'll experience 128L of beautiful full high quality dual hydrogen mono oxygen atoms. For the first time ever, our engineers have been able to deliver the most premium quality build showers and we're delighted to announce that it will also come in an incredible unapologetically rose gold color for just $99999.99. Is this what it costs to be environmentally friendly? I'm in when it's sub $80. Siri, get my backside, please. I'm interested! But not $400 interested. Atomizing shower heads have been around for at least fifty years if not further going back to the 1920's. Issue with these systems has always been mineral build up in the thin pipettes that spray out the water. What is new here? Interesting. The current water saving technology is to put a flow restrictor in to not use as much water. The atomizing facet is a "think different" type thing, and I hope they do well. Me - "Let's look at that... $130 for sewage and other fixed costs means that we're spending $5/month for water, and $65 to get rid of it." BTW - I'm not saying that we have the sprinklers running 24/7 on our brown lawn. I'm just saying that the kids enjoy playing with the hose on, and we get two uses out of it: Kids playing and watering the lawn. I just worry about the stuff worth worrying about. I think this is really cool. My only question is what about hard water. I live in a part of the country that has really high mineral content and I wonder how that would do with this atomizing process. I take it this news means that California is still suffering a catastrophic drought. I'm skeptical because it seems more like a mist, where the force would dissipate quickly after leaving the nozzle. Great for the head but I wonder if you'd get enough force lower down on your body. Which is why I suspect they had to add the wand accessory. Is there a shower head Edition version?